I recently listened to a podcast featuring popular philosopher and empathy expert Roman Krznaric. Among other fascinating concepts, he described a kind of hierarchy of empathy. Empathy is ingrained in the human condition; it comes to us naturally. However, the type of empathy we demonstrate as a young child – or indeed as a self-centred, individualistic adult – is very different in substance and effect to the type of empathy we might show in reflective maturity. As I listened to Roman speak, enthralled by his style, depth of knowledge and energetic contribution to the world of empathy, it occurred to me that a wonderful example of different types of empathy in action had been staring me in the face. One of the bedtime books on (very) high rotation at my house is Nick Bland’s The Very Cranky Bear. 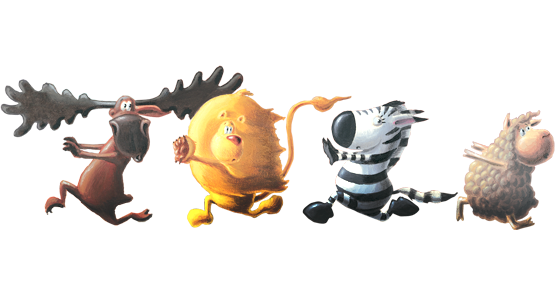 In this story, four little friends – Sheep, Moose, Lion and Zebra – found a nice warm cave in which they could play, out of the cold and rainy weather. Unbeknownst to them, in the dark corner of the cave was a sleeping bear – enter the title character of the story. Bear wasn’t thrilled at being woken – from what was presumably deep hibernation – by the playful giggles of the four little friends. He gave a very cranky ROAR and chased them out the door. Finding themselves back out in the cold rain, the four little friends didn’t give up easily. They were determined to play inside that cave. And here’s where the empathy comes in. The four little friends concluded that if they cheered up Bear he might welcome them back into the cave. Moose shared with his friends the tremendous satisfaction his antlers give him. Zebra said the same about his stripes. Lion insisted that antlers would be silly on a bear, a mane of gold is what he’d really want. 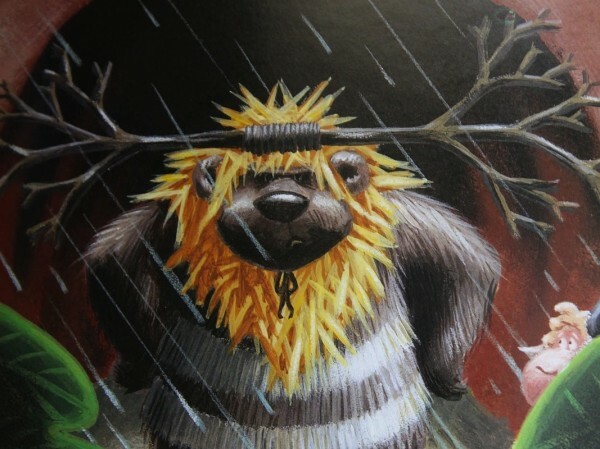 So, determined to cheer up the bear, they tip-toed back inside the cave where they strapped a branch to Bear’s head for antlers, painted on some muddy stripes and tied some golden grass around his neck for a mane. Surely, if these things give us so much joy, they thought, Bear will be thrilled! Not so. Bear was even more furious than before. Again, he chased them out of the cave. They ran for their lives. On his way back into the cave to resume his hibernation, he turned to the quiet and plain sheep, who’d been watching all of this foolishness unfold, and told her in no uncertain terms that all he wanted was a quiet place to sleep. Bear’s point hardly needed to be made – it’d been obvious all along. But it triggered a powerful thought for sheep. What if I was to give Bear not something that makes me happy, but something that would make him happy? and clipped off half her wool. She stuffed it into a bag until that bag was full. She tip-toed back inside the cave. ‘Excuse me, Bear,’ she said. ‘Well, thank you very much,’ said Bear and soon he fell asleep. Maybe he was dreaming of a plain, but thoughtful sheep. In the end, everyone got what they wanted. The four little friends got to play cards inside the warm and dry cave. And the bear got to resume his epic sleep – in a state of heightened comfort. Moose, Zebra and Lion engaged in Affective Empathy (or emotional empathy). They tapped into the emotional state of Bear (angry) and sought to respond to it positively. But they responded by giving Bear something that makes them feel good – they didn’t think about what might make him feel good. Sheep is the thinker of the group. She engaged in Cognitive Empathy. She tapped into the mental state of Bear – allowing her to respond with a gesture that would help him, in his particular situation. She gave him a pillow so that his sleep might be more comfortable. How often do we default to Affective Empathy – seeking to help people by giving them what would make us happy? Think about how this plays out on a personal level, for leaders in the work place or in public policy. What if we were to make a deliberate shift away from the automatic and easy response that leads us to what would help me if I were in this situation, towards the more cognitively demanding what might help them in this situation? You can find Roman Krznaric’s full talk to the Perth Writers’ Festival here. Or explore a little more about Affective and Cognitive empathy here.